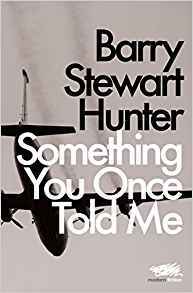 Trains and boats and planes – modes of transport abound in Barry Stewart Hunter’s interestingly varied collection of short stories, although the people they convey are seldom up to speed with their own lives. Persons in transit and the mental dislocations they experience are a recurring motif; thematically, however, there is a great deal more going on, much of which is intriguingly elusive. This is a collection for readers who have downed a few years derrière la cravate and know the score, if not themselves; who can recognize confident writing when they read it; who can pluck humour from the jaws of tragedy. The opening story, Accidental Death of a Novelist, begins to map the territory. Like others in the collection, it is a story in and of a city: ‘London’. That resonant proper noun is followed by a parenthetical dash, whose pause allows us to register its Dickensian connotations. Of course, it is neither necessary nor likely that the first paragraph of Bleak House spring immediately to mind, but its long, dark shadow is evoked nevertheless. Jack is a novelist whose largely unremunerative vocation is bankrolled by Miriam, his hard-working wife. They are sitting in their ‘modest Fiat’ at the traffic lights outside Hampstead tube station, listening to the car’s ineffectual wipers squeaking in the rain, and arguing about his unpublished novel. ‘I thought we’d agreed it was about London,’ says Jack querulously, whose earlier attempt at amplifying his theme – ‘The human heart in conflict with itself’ – could stand as the subject of the entire book. Accidental Death of a Novelist details the emotional self-pillaging required of a creative mind, the peevish desire to be understood if only one didn’t have to explain all the time, the stresses and surprises of love. Beginnings are often difficult, but Hunter is exceptionally good at them. ‘It was Bennett who found the first dog’ begins The Dog Murders, the strongest story of the collection, whose characters inhabit a kind of dingy Greeneland, replete with vicarious liability and occasional moments of grace. Another London story, it makes an outsider fret at his or her ignorance of the city and the significations of its geography. Bennett’s shortcut home from work as a hospital porter through Highgate Wood is a sad and menacing metaphor for his own young existence, with ‘little relief, little dimensional relief’, and ‘the insolent kiss of ivy in the dark’. Bennett is anxious to please and placate, but the direction of his life is not in his hands and he knows it: geography correlates with outcomes. He comes across a dog strung up and recognizes something of himself in its cursory life and lonely death. It is a peculiarly upsetting and frightening image; one thinks of traditional representations of Vodou and witchcraft, but it remains inscrutably sinister. In many of Hunter’s stories, relationships between people and with the world at large need to be renegotiated, often in fraught circumstances, whether it be ‘in a packed Central line carriage several metres below the busy Bayswater Road’ (New Shoes) or with a beribboned government minister wearing an Arsenal football shirt in an office in Juba (Incident at Juba). This is age talking, when the young have become a separate species and older male minds tend to mystery and longing. ‘If only the film could be wound backwards’ is a recurring plea of Clive and assorted kindred spirits. Their favoured cultural references are to things long past but which remain doggedly persistent emblems of their youth – John Lennon outside the Dakota building, Blood on the Tracks, Zager and Evans. Every now and then, remarks with their tongues hanging out suggest themselves as statements of intent: ‘Every journey towards recovery or redemption has its defining moment of crisis or breakdown’ (The Lucky Dust); ‘We’re just innocent bystanders, right?’ (Good Friday, Primrose Hill); ‘He had a function. Ah, joy! … It was enough to keep Denholm sane’ (Denholm’s Epiphany). Not inappropriately, the sad, bewildered face of character actor Denholm Elliott came to mind when reading this story, which strikes out in a new direction with a surreal opening: ‘If, in happier times, you had suggested to Denholm he might turn himself into a chair he would have laughed at you.’ Surrealism becomes literalism when Denholm subsequently experiences a pointillist dissolution/amalgamation with the physical world. From Incident at Juba onwards the stories tend to lose focus. In my opinion, The Metaphor Coast is the least successful; overlong, its tale of a rain of fish on Valencia relies too much on the writer’s undoubted technical skill in associating ideas and images, its loquacity reminiscent of William Saroyan, whom I find unreadable. Seven Sisters tries too hard to be not about anything but itself, its characters’ path to self-immolation potted with unlikely similes. Good Friday, Primrose Hill redeems the second half of the collection. Its description of two, simultaneous, live and literal reenactments of Christ’s crucifixion, voted on by ‘innocent bystanders’, is a serio-comic extension of current commercial logic, and perhaps the ultimate absurdity of the media’s continuing distortion of all that makes us human. The point seems to be that the very act of ranking competing Golgothas renders them valueless – empty signifiers, after all, form the perfect crown of thorns for a population anaesthetized by pervasive trivialization. In other words, maturity is in question throughout this collection, for in its trembling hands lies our wimpering future. Its pleasures and perils mostly traverse the male psyche, but women also make the journey, and not merely as adjuncts to men. I prefer the London stories, which make the normal and familiar distinctly strange, but Something You Once Told Me will, I believe, appeal to readers patient enough to read and reread tales that do not disclose their secrets all at once.